“Words are not peace. Thoughts are not peace. 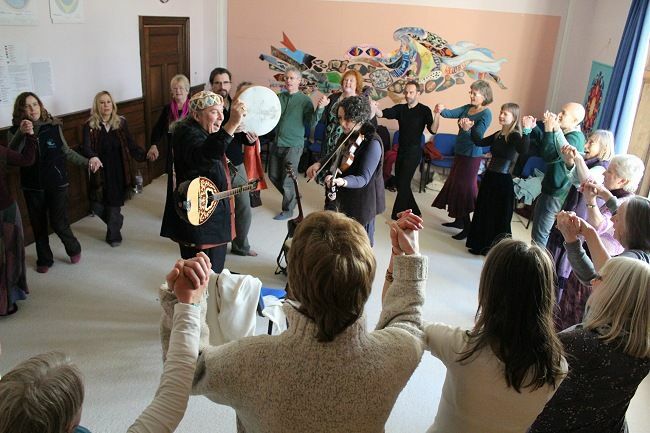 From the beginning of time, sacred movement, song and story have brought people together – at times of seasonal ceremony and celebration, as part of everyday life and life passages, in daily renewal and meditation, the Dances of Universal Peace are part of this timeless tradition. The Dances of Universal Peace provide a joyful, multi-cultural way to touch the spiritual essence within ourselves and others. The Dances are offered in a variety of ways, such as ongoing evening sessions, day workshops, longer residential retreats and dance camps. They are used in schools, colleges, prisons, hospices, residential homes for those with special needs, and holistic health centres etc. The Dances can also be part of life celebrations such as weddings and burials, peace gatherings, healing rituals, earth caring and ecumenical worship.